Posted on 10 August 2013 and filed under Second Life, Très Chic. My friend has many faces: a mother, a wife, an MD, dance lover… this is just the beginning. Rock chick is one of her faces too. And what does a rock chic do with her favorite blue jeans? She wears them until they fall apart. Until they they are torn, until those torn areas can be elegantly camouflaged… However, a moment comes when that can not be done anymore. Blue jeans can no longer be used as trousers, and that’s it. And what does my friend do when that happens? She brings the blue jeans to me, so I would upcycle them. 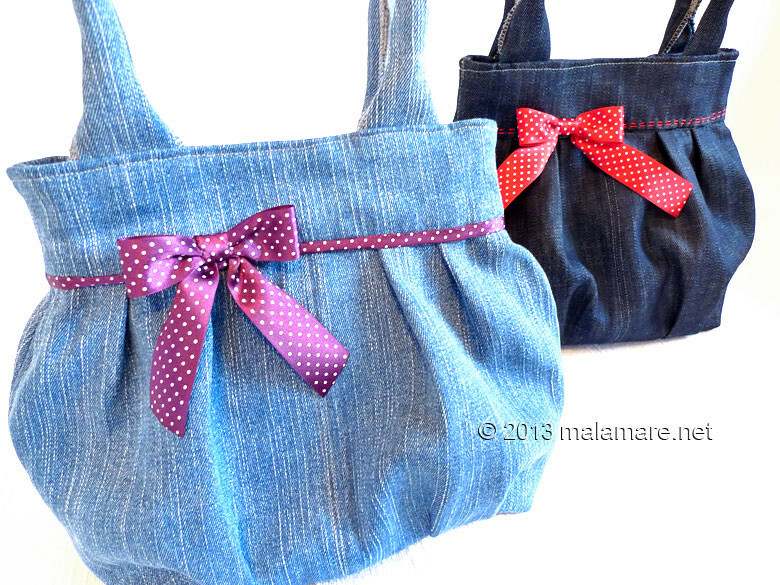 I grab my scissors, I cut, I sew – and I make a handbag. And my friend continues to use her blue jeans, but now in a new form – a handbag that is a lady and a rock chick: Rockette. 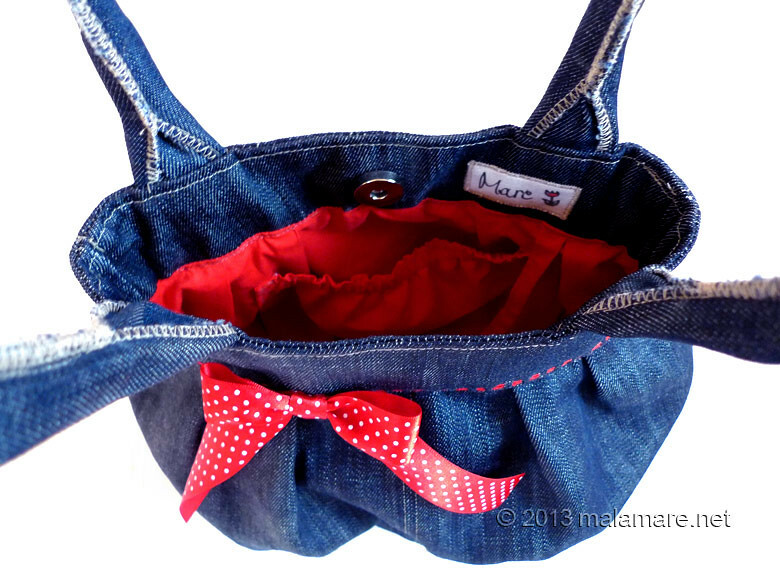 Rockette is upcycled blue jeans handbag, made from denim from my friend’s old blue jeans. 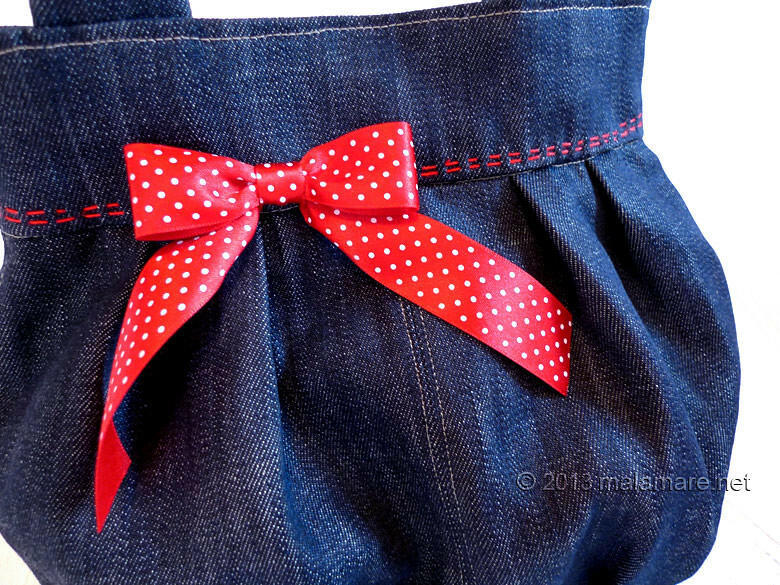 It is decorated with red and white polka dot bow and two hand stitched decorative seams in red embroidery thread. The bag inside is made from red cotton fabric and it hides a pocket and a ribbon with a key clip. The handbag has been strengthened with a layer of interfacing for firmness and shape. It closes with magnetic snap button. Top of the handles is on the height of 40 cm from the bottom of the bag. The bottom of the bag is 22 cm long and 10 cm wide and it has been strengthened so it will not sag, regardless of the quantity of necessities my friend carries in it.